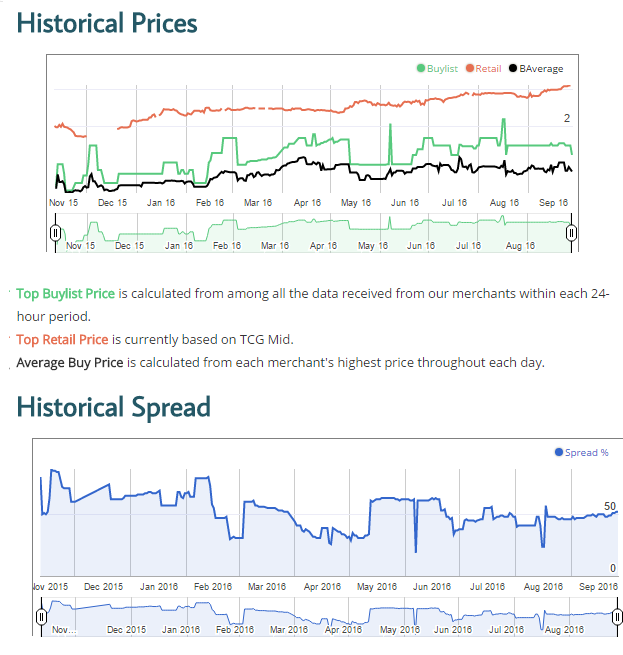 A common question I hear people ask is, “Will this card go up in price?” While it’s almost impossible to prove, there are many signs and data points you can use to determine if a card is trending up or down. Sometimes the card doesn’t see a lot of competitive play right now but it is still trending up due to casual play or supply constraint. One of the best ways to tell which way a card is trending is to look at the spread. Spread is one of the most important factors that can lead to you a decision of when to buy and where the card is trending. Spread is a concept in finance that refers to the difference between buy price and sell price. In Magic finance, spread is usually expressed using the buylist price as a percentage of the sell price. For example, a card that sells for $100 and is bought for $50 has a spread of 50%. This percentage is directly related to how a vendor feels about the value of a card. Dealers offer lower spreads on card they are more aggressively acquiring, which could be for a number of reasons. Ultimately, whether it’s because they’re out of stock or selling the card quickly, the end result is that they’re willing to pay more money for the card. 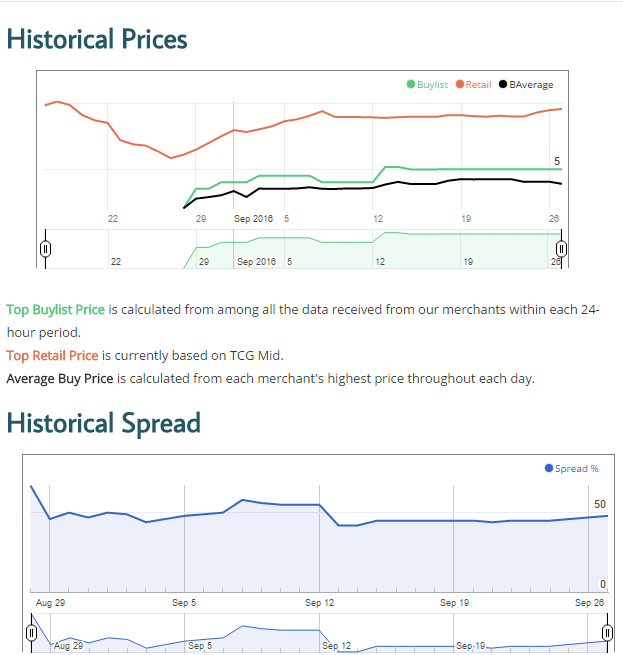 When a card’s spread gets too low, it’s not worth selling at the old price and the price goes up. Sometimes this happens very quickly, to the confusion and irritation of many players. Sometimes it happens slowly and people wonder how nobody noticed. Let’s take a look at a few cards and analyze how spread could have helped us predict a card’s future movement. All of the following charts come from Quiet Speculation’s Trader Tools app. 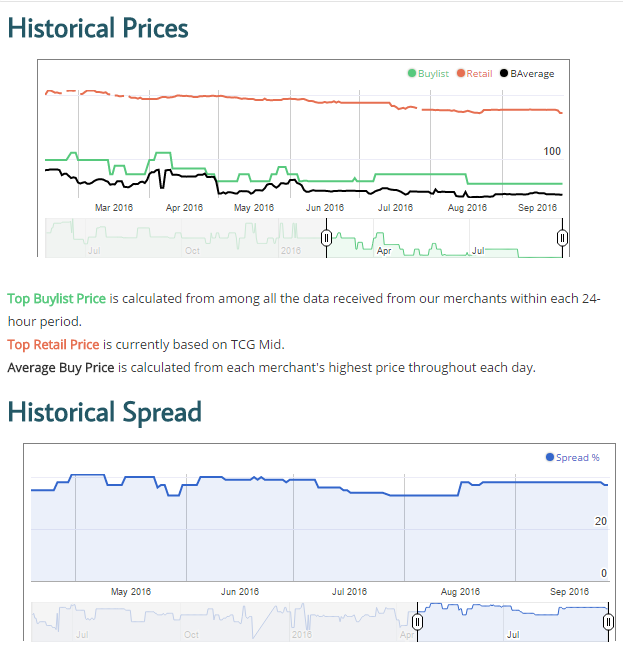 This is the price graph for Noble Hierarch. The current spread is 32% between the best buylist and the best sell price, which is pretty good for a staple. You’ll see on the Historical Spread graph that during August the spread takes a nosedive and ends up below the graph. That is not an error. Because Quiet Speculation pulls information from multiple vendors it is possible for cards to have a negative spread. This means you can buy them from one vendor and sell them to another vendor for more money. This is known as arbitrage, and it also happens in the global financial market. Opportunities for arbitrage are rare and often short-lived, so it’s important to take note when they do happen. If it happens for long enough, vendors are likely to take notice and raise/lower their prices to remove the arbitrage opportunity. Arbitrage can happen at events too. I have purchased cards from a vendor at a Grand Prix and walked them to the other side of the hall to sell them for more than I paid. Noble Hierarch is currently showing that it still has room to grow. If you’re putting off getting them to finish your deck you are not doing yourself any favors. Because the buy price of the card has been consistently rising alongside the sell price, it shows that people are willing to pay more and won’t sell for the same amount. This graph is a good textbook example of typical Magic pricing. The above graphs are for the Inquisition of Kozilek reprint from Conspiracy: Take the Crown. In the past few weeks we’ve seen the spread grow. It’s small enough that you won’t immediately notice it but this is part of the reason why I said Inquisition of Kozilek was in for a really rude awakening. The current retail price of $10 can’t survive much longer. At some point, the buylist price will either become laughable or stores will have too many copies in stock and be forced to lower their price. Right now Inquisition has a spread of 48% which is among the worst for Modern staple cards. I’ve said that I think this card could be $4-5 in December and this price graph shows us vendors think we’re heading in that direction too. If you’ve been thinking about buying Inquisition of Kozilek, you’ll be doing yourself a favor by waiting. Some cards fall in price but still maintain a pretty reasonable spread. Do you know what card this graph represents? If you guessed Tarmogoyf, you’re right. The spread for Tarmogoyf hasn’t really changed much since the beginning of the year as it has bounced between 35% and 41%. This is despite the fact that this graph shows Tarmogoyf falling $20 in five months. Dealers can be confident that certain cards will sell despite a falling price. Tarmogoyf is as close to a “blue chip stock” as you can get in Modern. It’s powerful and irreplaceable and has a legendary status that gives it value to everyone who plays Magic. It doesn’t matter if Tarmogoyf becomes less popular; it will always be worth some amount of money due to it being a status symbol. That said, cards like this are really hard to predict accurately because even though the price of the card is falling, the spread is staying almost the same. If you read my previous articles, you know I advocate waiting for reprints when the timing makes sense. Modern Masters 2017 was announced a few weeks ago as part of next year’s product lineup. There’s not a lot of information in the article except that it will include cards from Innistrad and Return to Ravnica blocks. If Wizards wants to sell a set with cards that headlined Innistrad block, it’s hard to leave out Snapcaster Mage and Liliana of the Veil. 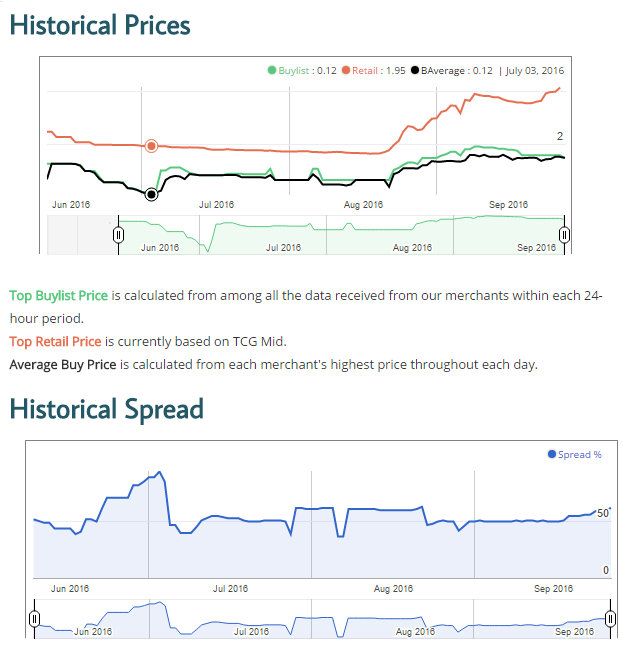 The above graph is the current price graph for Snapcaster Mage. With a spread of 35%, it’s almost as solid as Noble Hierarch but it’s also been on the downturn this year. Some of this is because of its blue chip-ness and some of it has to do with the fact that the theoretical reprint is still six months away. The recent history shows the spread decreasing on Snapcaster Mage but I would be very wary of buying in now if it’s not the last card you need to finish your deck. I think we could see some vendors loosen up and let the card drop a bit now that Modern PPTQ season is over. How the spread changes over the next two months will be a big indicator of how low it can go. Similarly, Liliana of the Veil also has a pretty tight spread. At 30% it’s one of the lowest for Modern Staples. The reprint risk is high in Modern Masters 2017 and I would be wary of buying them if you don’t feel like you will get significant play in the next six months. Liliana is the second most expensive card in Modern after Tarmogoyf and comes with a ton of risk buying in now. What other cards might have a lot of risk? As you can see, the most expensive cards in Modern have some thin margins. Vendors are happy to buy them close to their sell price, confident in their ability to sell them at a profit before they decrease in price. That being said, if you are looking to get any of these cards they won’t decrease in price until they get reprinted. The demand is just too high at the current prices for there to be any incentive to lower them. These types of cards are the biggest hurdles for newer players trying to get into Modern and players trying to switch decks. I believe Wizards of the Coast has many of these cards on their radar for reprints over the next few years. Sometimes cards get really expensive or popular because of rumors. Sometimes people panic-buy and they spike. In both cases, watch the spread. If buylists don’t quickly follow and the spread increases instead, then this is probably not a good buy. The graph above is for Bloodbraid Elf. It’s a card that was rumored to be removed from the Modern banned list this month. As Bloodbraid Elf crept up in price, the spread also crept up. It’s up to an enormous 63% right now which should tell you all you need to know: it’s not worth the $4 it’s currently selling for. Vendors are only paying $1.50 for it, and now that it hasn’t been unbanned I expect it to drop back down to $2 in a few months. 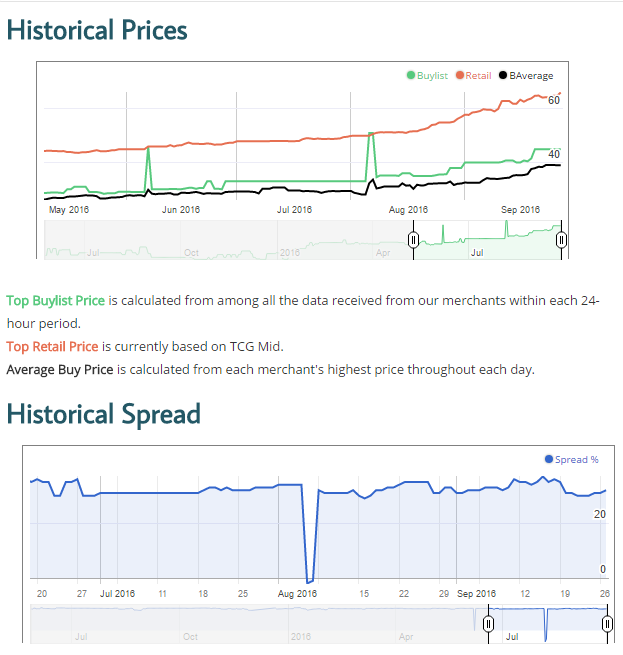 Sometimes buylist prices go up and down without really changing the price of a card. This kind of activity is most common on more casual staples like Sol Ring (shown above). When a store runs out or runs low they will bump their buylist price up to get some more supply. Right now Sol Ring has a spread of 30% because one vendor is paying $1 more than all of the other vendors on a $3 card. If you play competitive Modern you are unlikely to see many of these cards come up. If you play more casually, you will see it with the types of cards that are played in fringe decks and more casual formats like Commander. Platinum Emperion (until recently) is a good example of the type of fringe or casual Modern card that will see some periods of negative spread while stores try to restock. Prices should remain relatively stagnant for about a month until the next Modern Star City Games Open in Milwaukee (Oct 22-23). I’m not sure if there will be a ton of people trying out new cards in Modern this weekend but keep a close look at the top of the Classic just in case. If you’re a big fan of watching Modern, there are really only a few events left until the end of the year. We will only have one Modern Grand Prix with Kaladesh before Aether Revolt. After the Open in Milwaukee there is only one more Modern Open (Columbus) and the Player’s Championship before we close out the year. Modern cards (as well as Standard) should be trending down for the rest of the year. I’ll make sure to remind you as the time approaches, but the best time to buy will be in December. I liked the article. It took me twice to understand it properly (finance is not my field), but I think that it’s well written. It goes deep into some interesting aspects that are usually pretty obscure. I really like these articles about the financial aspect of MTG. It’s really helpfull when you’re trying to know if you should buy something or wait a bit. Also, what would you say about Scapeshift? Scapeshift is a card that will keep increasing or stay the same until it gets reprinted. At this point there is no telling when that may happen so your guess is as good as mine when it’s a good time to buy. As a relative newcomer to this sort of thing, I found this article very helpful. Thanks!